The Catch operator intercepts an onError notification from the source Observable and, instead of passing it through to any observers, replaces it with some other item or sequence of items, potentially allowing the resulting Observable to terminate normally or not to terminate at all. There are several variants of the Catch operator, and a variety of names used by different ReactiveX implementations to describe this operation, as you can see in the sections below. In some ReactiveX implementations, there is an operator called something like “OnErrorResumeNext” that behaves like a Catch variant: specifically reacting to an onError notification from the source Observable. In others, there is an operator with that name that behaves more like a Concat variant: performing the concatenation operation regardless of whether the source Observable terminates normally or with an error. This is unfortunate and confusing, but something we have to live with. RxClojure implements this operator as catch*. This operator takes two arguments, both of which are functions of your choosing that take the exception raised by onError as their single parameters. The first function is a predicate. If it returns false, catch* passes the onError notification unchanged to its observers. If it returns true, however, catch* swallows the error, calls the second function (which returns an Observable), and passes along the emissions and notifications from this new Observable to its observers. RxCpp does not implement the Catch operator. Much like onErrorResumeNext method, this returns an Observable that mirrors the behavior of the source Observable, unless that Observable invokes onError in which case, if the Throwable passed to onError is an Exception, rather than propagating that Exception to the observer, onExceptionResumeNext will instead begin mirroring a second, backup Observable. 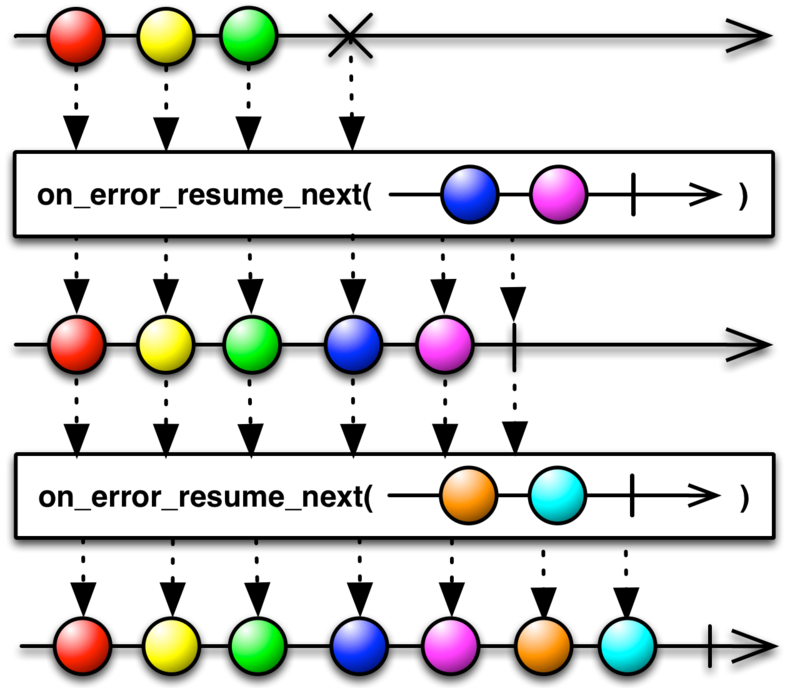 If the Throwable is not an Exception, the Observable returned by onExceptionResumeNext will propagate it to its observer’s onError method and will not invoke its backup Observable. 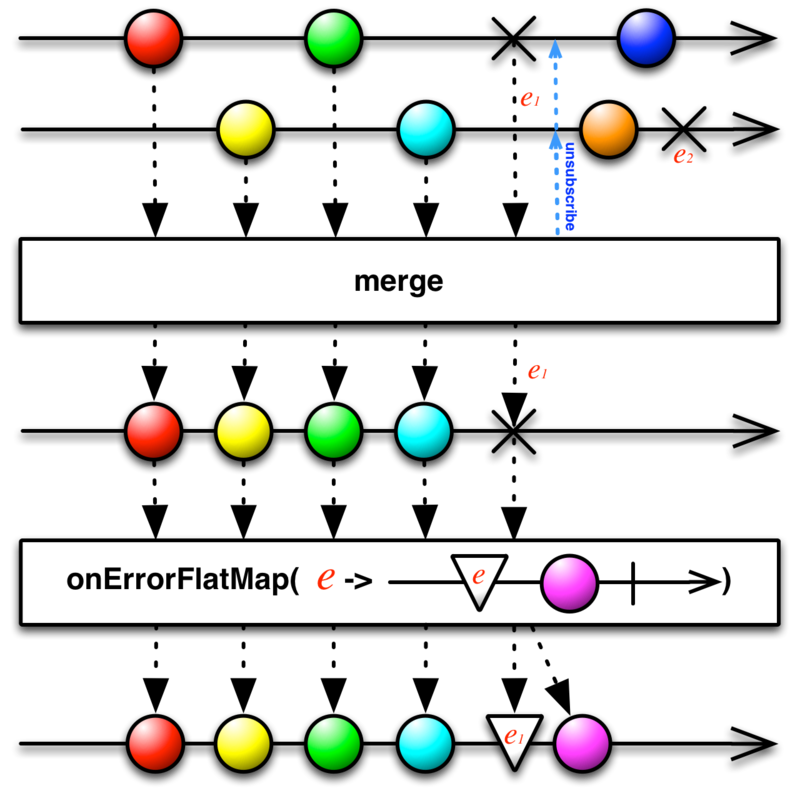 The onErrorReturn method returns an Observable that mirrors the behavior of the source Observable, unless that Observable invokes onError in which case, rather than propagating that error to the observer, onErrorReturn will instead emit a specified item and invoke the observer’s onCompleted method. The onErrorResumeNext method returns an Observable that mirrors the behavior of the source Observable, unless that Observable invokes onError in which case, rather than propagating that error to the observer, onErrorResumeNext will instead begin mirroring a second, backup Observable. This implementation borrows the confusing nomenclature from Rx.NET, in which onErrorResumeNext switches to a back-up Observable both on an error and on a normal, error-free termination of the source Observable. The Catch operator has a variant that allows you to specify which sort of Exception you want to catch. If you use that variant of the operator, any other Exceptions will be passed through to the observer as if the Catch operator had not been applied. This implementation introduces a confusing nomenclature, in which in spite of its name OnErrorResumeNext switches to a back-up Observable both on an error and on a normal, error-free termination of the source Observable. It is therefore more like a concatenation operator. RxPHP implements this operator as catch. Continues an observable sequence that is terminated by an exception with the next observable sequence. You may pass catch_exception a set of back-up Observables either as individual function parameters or as a single array of Observables. If it encounters an onError notification from the source Observable, it will subscribe to and begin mirroring the first of these back-up Observables. If this back-up Observable itself issues an onError notification, catch_exception will swallow it and switch over to the next back-up Observable. If any of these Observables issues an onCompleted notification, catch_exception will pass this along and will stop. You may pass on_error_resume_next a set of back-up Observables either as individual function parameters, as a single array of Observables, or as a factory function that generates Observables. When the source Observable terminates, whether normally or with an error, on_error_resume_next will subscribe to and begin mirroring the first of these back-up Observables, and then will recursively continue this concatenation process for each additional Observable until there are no more Observables to mirror, at which time it will pass on the onError or onCompleted notification from the last of these Observables. You may pass rescue_error either an Observable or a factory action that generates an Observable. In Rx.rb, on_error_resume_next inherits the misleading nomenclature from Rx.NET in that it concatenates the second Observable sequence to the source sequence whether that source sequence terminates normally or with an error. onErrorFlatMap handles a special case: a source Observable that is noncompliant with the Observable contract in such a way that it may interleave onError notifications with its emissions without terminating. This operator allows you to replace those onError notifications with the emissions of an Observable of your choosing without unsubscribing from the source, so that any future items emitted from the source will be passed along to observers as though the sequence had not been interrupted with an onError notification. Because onErrorFlatMap is designed to work with pathological source Observables that do not terminate after issuing an error, it is mostly useful in debugging/testing scenarios. Note that onErrorFlatMap will not react to both errors generated by both Observables, but only to the single error passed along by merge.